Before the 19th election for members of the National Assembly, the political parties nominated their candidate. Jung Chi-Sung kisses up to the party's leader to become nominated. He also received money from the president of Joeun Savings Bank and gives it to his party leader. 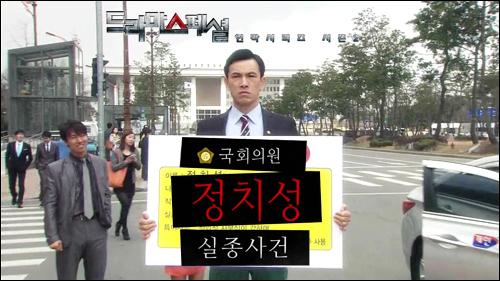 "Missing Case of National Assembly Member Jung Chi-Sung" takes over the KBS2 Sun. 23:30 time slot previously occupied by "Drama Special Series: The True Colors of Gang and Cheol" and followed by "Drama Special Series: SOS - Save Our School" on May 20, 2012. Migthy Thor May 21 2016 10:33 pm GREAT mini drama! Yu Oh-Seong is a brilliant versatile actor!